Whales is an outdoor interactive performance by kiwi experimental theatre company, Binge Culture, a group in search of participative theatre that is profound, and the audience’s part integral. 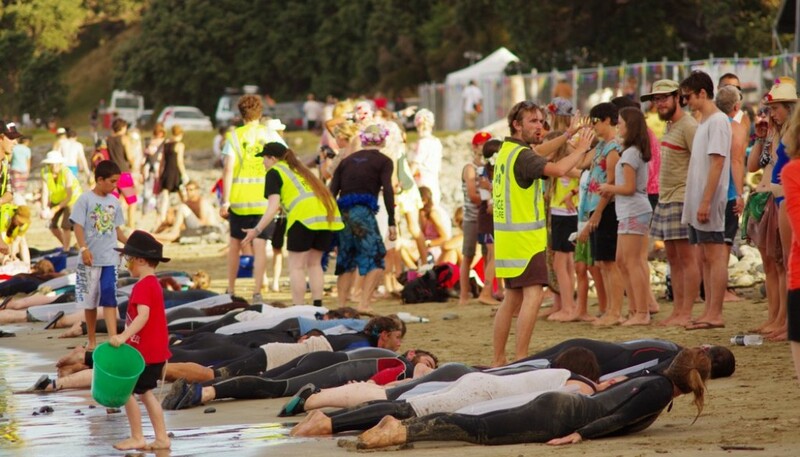 In staging a whale stranding (which are a relatively frequent occurrence on New Zealand beaches) they attempt to engage the public in a mass performative event, bringing strangers together over a fictional crisis. Twenty or more performers embody a pod of whales moving across land – whatever the environment, city streets or grassy parks – as if in the water, navigating the coastline. Dressed simply in black wetsuits with crude flippers strapped to their arms, the whales emerge and ‘swim’ slowly across the land toward the ocean. Past surprised spectators, the pod glides serenely through the crowds, only to become stranded a short distance from the waters edge. Whether beached on concrete or sand the whales are in obvious distress, drawing the public towards the site of the performance’s climax. More performers dressed in hi-vis arrive to co-ordinate the rescue, enlisting volunteers to help out. Adults and children pull together to care for the helpless creatures. They share buckets and towels – working in teams to fill buckets with water and using the wet towels to keep the animals cool – they sit and talk and even sing to the whales. Performers in the whales rescue response team move between groups of the public offering advice and assistance, drawing information from the Department of Conservation’s protocol for whale strandings. Saving the ‘whales’ is a beautifully simple action, which encourages broad public immersion into the fiction. Children, as you might expect, buy into the scenario entirely – to the point that one boy was heard to remark “whales look a lot like people, don’t they mum?” – but it is surprising how seriously adults take the game also. Binge Culture hypothesise this eagerness can be attributed to an innate desire to play, and an empathy with whales that allows a kind of reverse anthropomorphism . 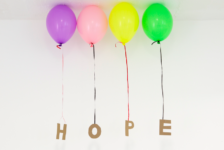 This, combined with familiarity with the rules of engagement, clear tasks and a sense of urgency, make it easy and natural for people to join in. The performance ends with the response team declaring the tide high enough to begin a refloat. Volunteers re-orientate the whales and, as they start to move independently, then form a human chain to usher the whales out to sean and to prevent a re-stranding. The whales then enter the water, by jumping or wading or whatever way suits their location, to the jubilant cheers of the crowd. After the final act, the whales morph back into humans, the game ends, the helpers and onlookers drift away. Then there is the chance to reflect on more sober themes. Thoughts of commercial whaling and environmental degradation float up, and questions around disaster mentality and the authenticity of our altruism lurk beneath the surface.